The rapper appeared on Larry Wilmore’s show to discuss the viability of single Presidential candidates. 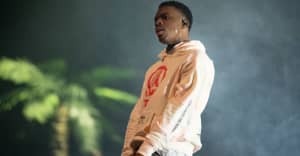 Vince Staples took an unconventional approach to album promotion last night. Instead of doing an interview about his forthcoming record or performing a song from it, he popped up on The Nightly Show with Larry Wilmore, where he sat on a panel with two comedians—Mark Yard and Gina Yashere—to discuss the Republican presidential candidate Lindsey Graham and whether or not single people should be allowed to run the nation. "The president being married was kind of to make it more relatable to the way a household was built at the time period when this thing first started," Staples told Wilmore. Yashere had a different take on things: "the problem is not that [Graham's] single," she noted. "It's that they think he's gay." Watch the round-table above. You can read FADER’s recent interview with the rapper here, and check him out on FADER TV below. Summertime '06 drops June 30.